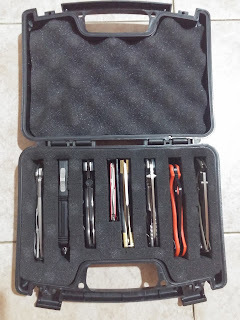 Best Chinese Knives: Great Affordable Knife Collection Pelican Case Style Storage Option - Pick n Pluck Foam Gun Case - Keep your knife collection safe and secure! Great Affordable Knife Collection Pelican Case Style Storage Option - Pick n Pluck Foam Gun Case - Keep your knife collection safe and secure! I'd like to recommend you an affordable, safe and secure way to store your knife collection, that I use. It is labeled as a gun case, but is perfectly suitable for knife storage. The case is made from hard plastic, has a seal to protect from humidity, has double clasp and can be locked using a regular U lock. But the best part of it is the Pick n Pluck Foam (just like in the Pelican cases) - so you can fit the cutout for each knife, and prevent unnecessary movement inside the case. It fits for secure storage of up to 8 knives, 4 large ones (app. 4' blade) and 4 medium sized (3.5 inch blade and less). The case is great for transporting several knives and to keep them secure inside the house - out of reach of children. Looking pelican, camera, telescope, drone & gun cases in Australia? Our products are designed from the ground up and rigorously tested to ensure upmost quality.